Are you separated & struggling to stay positive around your kids? It’s difficult to be positive around your kids when you’re dealing with your own issues, like anger, sadness and loneliness. All dads want to be the best father they can. But it can be tough to know how to do this once separated, especially when there’s ongoing conflict with your ex-partner. Please note that these tips assume you have at least some contact with your children. We recognise that is unfortunately not the case for all separated men. Research shows that children can be psychologically harmed by seeing their parents arguing, yelling and using physical violence. So it’s really important to try to develop a ‘business like’ relationship with your ex-partner, keeping the kids out of any conflicts. Avoid arguing in front of children. If this is difficult, many contact centres offer a ‘change over’ service so that parents do not need to come in contact when transferring children from one parent to the other. If you do find yourself in an argument while your kids are around, suggest to your ex-partner that you both take some time to calm down and resume the discussion later (see managing anger for further reading). Try to communicate directly with your ex-partner and avoid asking children to relay messages. Don’t put the other parent down in front of the children, undermine their parenting, or ask your kids to take sides in any conflict (even if you feel that the other parent is doing this). Research indicates that effective fathering increases a child’s chances of developing good self esteem, moral strength and intellectual and social competence. Fathers also experience many benefits to their wellbeing and psychological growth when they are closely involved with their children. Children often blame themselves for their parents’ separation. Because they are often too young to understand adult relationships, they sometimes feel that there must be something wrong with them which caused the separation. It is especially important to remind your kids how much you love them by giving them lots of hugs and reassurance. Tell them clearly that they are not responsible for the separation and that even though you can’t spend as much time with them as before, you love them just as much. 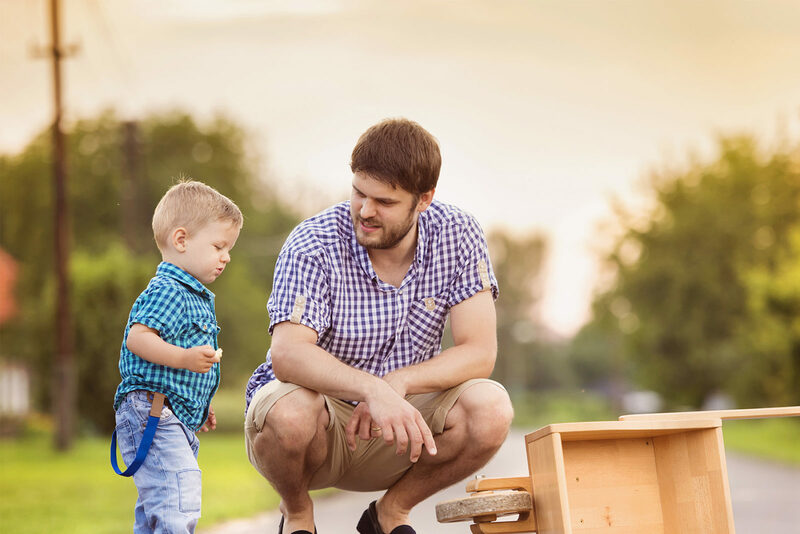 Shared parenting plans are an agreement between both parents that covers everyday parenting issues such as bedtime, rules about things such as television and computer game use, how discipline will be enforced and so on. Routine and rhythm are important to children and while there will always be differences in your parenting styles, the greater the consistency between their two homes, the more secure they will feel. It is also easier to maintain discipline with children if the rules are clear and consistent. If ongoing conflict between you and your ex-partner makes it difficult to parent co-operatively, professional mediation may help. MensLine Australia can refer you to an appropriate service in your area. Although there is no denying that separation is a very difficult time both for you and your children, it can also be an opportunity to develop a closer relationship with your kids. Traditional relationships often leave the nurturing and practical parenting roles to the mother, with the father providing back-up discipline. Separation presents many men with the challenge of being much more involved in every day parenting. If you take up this challenge, you can find new levels of satisfaction in your role as a father.